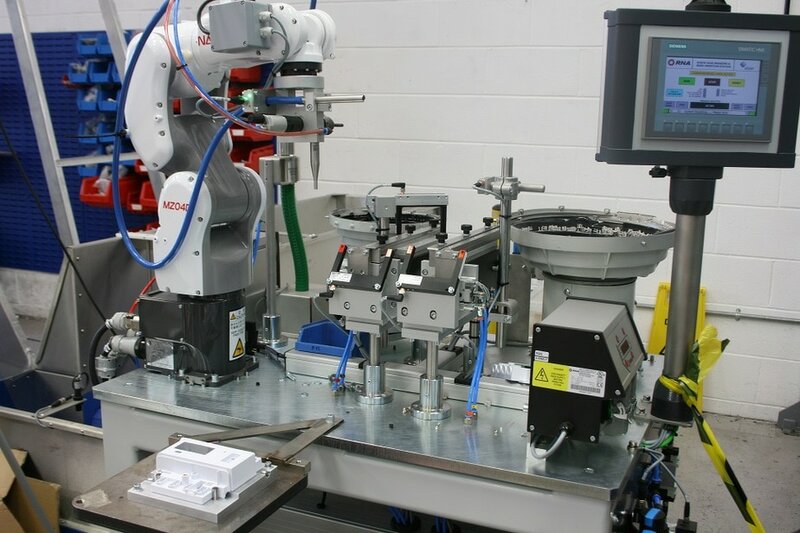 A fully automatic robot system to shear and discard 2 screw heads for meter housings and assemble two plastic bungs to the smart meter housing on a new smart cell test and print machine. The sheared screws are removed and deposited into a waste container via a chute using a Nachi 6 axis robot. The bungs are fed using individual bowl feeders to escapement and are assembled using the same robot using vacuum and are fully assembled using plunger mechanisms. The meter housings are indexed from the existing laser printing station to the shear and bung assembly station using the main machine pallet indexing system.